Posted November 10th, 2017 by Jeremy Dalton. Service South specialises in home entertainment systems and can help you in Atlanta, Fayetteville, McDonough, Newnan GA or Peachtree City. There are various types of home entertainment systems including home theater, games rooms, music systems and more. Home theater is arguably one of the more in demand home entertainment options. If who want a true cinema experience in your home then you need the right design and professional installation. It is important to achieve the right mix and balance of electronics, acoustics, lighting, control, seating, accessories and aesthetics. There standards that should be followed when it comes to home entertainment systems. These include THX and CEDIA standards. This way you get a home entertainment system that performs properly and is easy to use. Who does not want a nice entertainment area in their home? Now you may already have your traditional BBQ area, pool and similar entertainment facilities. But here we are talking about a multi-purpose media room. You can have a games room with the latest in audio-visual and computer gaming options. And of course, if you want your arcade machine on the side, why not? It’s all up to you. Home entertainment systems allow to enjoy quality time at home. The kind of time you want to spend with loved ones, friends and family. 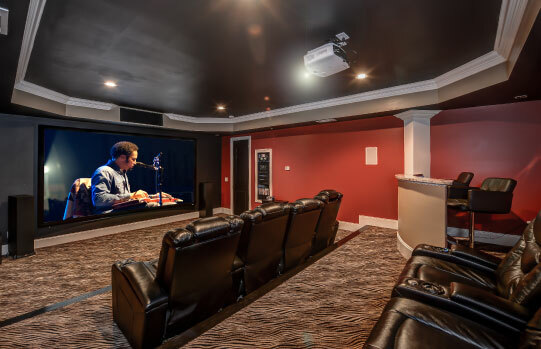 Service South can create a state-of-the-art multi-purpose media room where you can lose yourself in exciting video games and related entertainment systems. Play virtual golf, listen to your favorite music or watch a scary movie with true surround sound – it’s all up to you. Service South is your go to guy in Atlanta, Fayetteville, McDonough, Newnan GA or Peachtree City for high-quality state-of-the-art home entertainment systems. Problem is once you have all these great entertainment areas, it might be harder to get your friends to go home! Home Entertainment Systems and Home Theater in Fayetteville and McDonough GA. Offering Low Voltage, Sonos, Home Theater Installation, Home Audio Systems, Home Automation.